In the mid 1700s, Anabaptists fled persecution in Europe, settling in Pennsylvania and 19 other states. They are now a presence in Aroostook County and other parts of Maine, and they have brilliantly colored my childhood memories. We are fortunate to have these talented folks in our midst. 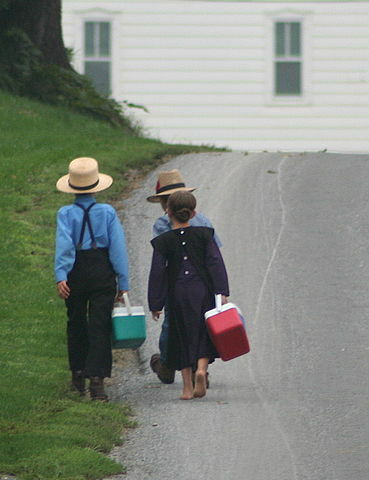 Known collectively as Pennsylvania Dutch, both sects, Amish and Mennonite share similar history, fashion style, and religious beliefs. The difference between them is lifestyle—Amish live off the grid and travel by horse-drawn carriage while Mennonites accept and use technology and embrace the convenience of motorized travel. For the next couple of columns, I will feature food from these gentle, hardworking, devoted folks. Of course, most of the dishes derive, not from Dutch, but from German cookery (Deutsch is German for German! )—usually very simple with fewer ingredients than most other European fare. But hard work deserves good food, so these dishes do not lack richness and satisfaction! Spaetzle is a German noodle they call dumplings . Great mixed with hot buttered whole green beans or as a side with schnitzel gravy. HINT: Dropping the batter into boiling liquid using a funnel or a metal colander will make it easier than pouring from a bowl. Batter can be thinned a bit if necessary. Cooking time is not specified so taste testing is necessary! Start testing after 3 minutes. If you’re on a salt-restricted diet, skip salting the cukes and onions. Or if you’re too lazy to do it, that’s okay, too. You will need to eat it all up the same day, though, because the water will leach out into the dressing over time. My Aunt Myrtle taught me how to make this. It disappears from the table quickly. Sprinkle cukes and onion with a teaspoon of salt and let stand for a few minutes. Pat with towel or absorbent paper to remove moisture. Place cucumbers and onions in a bowl, dissolve sugar in the vinegar, add a pinch of salt and mix with sour cream. Toss thoroughly with cucumber mix to cover. Turn out to a serving dish; dust with pepper and parsley or dill. Chill. Best eaten same day. Place 4 Tbs of bacon grease in a large heavy pot. Brown one finely chopped onion till golden. Shred one 2½ lb head of red cabbage. Mix ¼ cup vinegar with ¼ cup water and 2 Tbs sugar. Next, place cabbage in onion and grease. Pour vinegar and sugar mixture over. Salt and pepper to taste, and combine. Bring to boil over medium high heat taking care not to scorch bottom. Quarter 1 large pared, cored apple and place on top of cabbage. Lower heat, cover, and simmer 20 minutes. Makes 10 servings. Wash spinach and remove tough stems. Drain and cook with a little water in covered pot over moderate heat for 8 to 10 minutes. Drain and chop finely. Add milk, beaten eggs, 1½ cups of the bread crumbs, butter, salt, pepper then mix well. Sprinkle the remaining ½ cup bread crumbs and the chopped bacon, on the top. Bake in moderate oven (350 ° F) 35 minutes. Rivels are miniature dumplings dropped into soup, similar to spaetzle, to extend the volume of the meal and add taste and texture with little effort. Add corn to water and cook for 10 minutes. Mix egg, flour and milk together in a medium size bowl. Pour this batter through a colander, letting it drop into the boiling corn. Add butter and salt. Cook slowly in a covered pan for 3 minutes. Test for doneness. Garnish with chopped parsley. Serve immediately. Prepare jars for canning by sterilizing in a large pot of boiling water or baking jars in the oven. See a book like Putting Food By (Hertzberg, Vaughn and Greene) for exact canning instructions. Remove greens and root strings taking care not to trim too closely or beets will “bleed” into the cooking water. Boil until tender. Cool a bit, remove skins, and cut into thin slices or chunks as desired. Tie spices in cheesecloth packet. Bring to a boil the vinegar, water, sugar, and spices. Add beets and boil 5 minutes. Pack in sterile jars and fill with hot liquid. Seal. In high school I cleaned house every Saturday for a couple, both artists, who were of German descent. After working for a couple of hours, they would put out a spread on the kitchen table and their two children and I would enjoy these delicious beets and eggs along with thick slices of creamy Meunster cheese and dark pumpernickel bread. I still use their recipe for the beets to this day. To make red beet eggs, thinly slice some red onions and add to hot pickled beets about two-thirds up in a large jar. Cool. Hard-boil six eggs. Remove shells and drop the eggs into the jar making sure they are totally submerged in the liquid. Refrigerate at least overnight. Longer is better. These take on a beautiful color and excellent flavor and are grand as appetizers served with crisp vegetables. They are also good sliced in sandwiches or salads. This entry was posted in Comfort food, History, Pasta & Noodles, Vegetables and tagged Amish, Pennsylvania, Pennsylvania Dutch by cmtstardesign. Bookmark the permalink.